Chocology Unlimited | Chocology Today tagged "sensory training"
Last week we learned about the process of growing and harvesting Cacao. This week in part 2, we will discover what happens after the harvest and how the cacao bean is transformed into the delicious chocolate that we eat. Making the Beans Ready for Chocolate Makers Fermenting Either the fermenting house or the farmer ferments the cacao beans. This is an essential step as it affects the flavor of the chocolate it will produce. Fermentation is performed for three reasons: to stop germination, to destroy the seed coat and to enhance flavor. If the farmer has chosen to do this step, he will ferment the beans on a tarp in a field and cover them with banana leaves. He will stir the beans periodically until they go from a purple color to the dark reddish color of a fermented cacao bean. 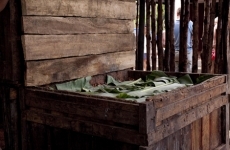 The fermenting houses ferment the beans in wooden boxes for six to ten days. These wooden boxes have holes in the bottom where the juices can flow out. The beans are moved from box to box every two days until fully fermented. Drying After fermenting, the beans must be dried. The humidity of the beans must be lowered to 6% to 8%. They are often dried in the sun on tarps and raked often to promote even drying and prevent molding. Drying houses may also be needed when the weather turns to rain or conditions are unfavorable for sun drying. 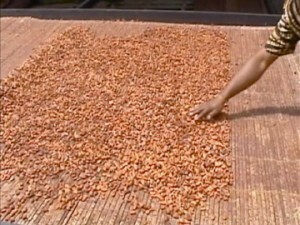 Drying can take up to a week, but care must be taken to dry the beans perfectly. Too little drying can create mold while too much drying can make the beans brittle. When the beans are sufficiently dried, they are sorted. 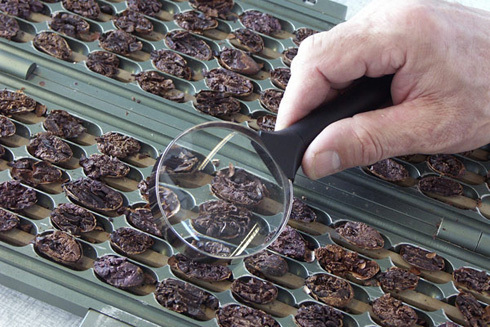 Beans that are flat, moldy, germinated or broken are removed. Only quality beans are stored. They can be stored in sacks for up to 5 years. They are now ready for shipping to the chocolate makers of the world. The Processing and Manufacturing of Chocolate Roasting and Winnowing When the dried beans arrive at the manufacturing plant, the beans are roasted at different temperatures and for different lengths of time depending on the humidity, the desired taste and the size of the bean. After roasting the beans are “winnowed” (cracked) to remove the outer shell, leaving only the nib, which is the essential ingredient for making chocolate. 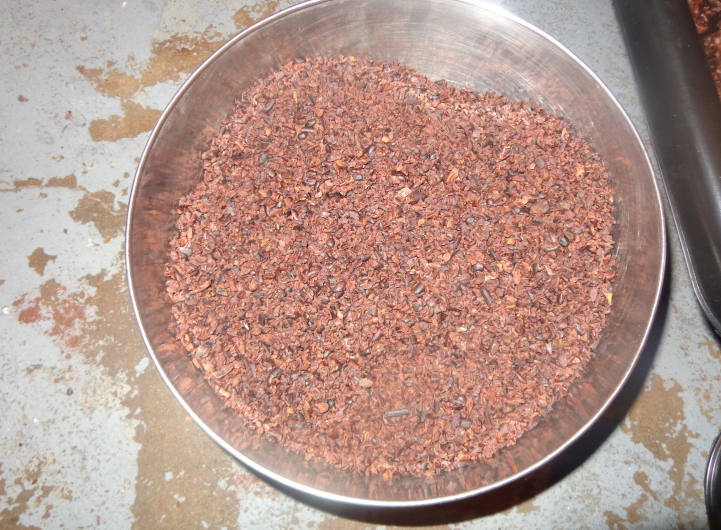 Grinding After roasting and winnowing, the nibs are ground into a paste called cocoa liquor. It is here that the cocoa liquor can be used either to produce chocolate bars or go through further processing to separate the fat from the solid. The fat is called cocoa butter and is used in many candies and beauty products. 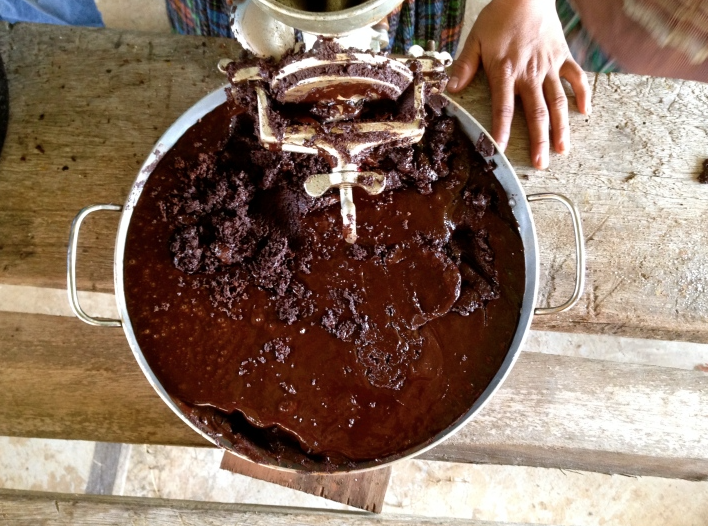 The solid is called cocoa press cake and can be used to make cocoa powder and hot cocoa products. Conching It is at this stage that the chocolate making can happen. The chocolate liquor is mixed with sugar, vanilla and milk (for milk chocolate). Conching is the process of mixing the ingredients for long periods of time to remove the acidity of the cocoa and develop flavor even further. Some conching can take 24 to 72 hours, depending on the desired end product. The continuous mixing of ingredients creates incredibly smooth chocolate with balanced flavors, eliminating grainy or overpowering tastes. Tempering and Molding The next step is to temper the chocolate. The chocolate is cooled and then warmed multiple times until it’s of the right consistency. This is the tricky part. 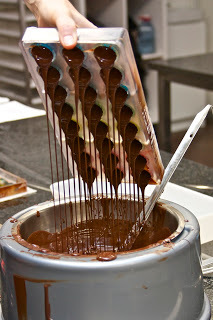 If done correctly, tempering is what gives chocolate the smooth texture and snap when broken in two. After the chocolate is tempered, it is ready for additional ingredients such as nuts, sea salt or coffee beans. It is then poured into molds and takes the shape of the confection that will be sold. Once the chocolate is cooled, it is removed, wrapped in its inner wrapper, labeled and placed on pallets for shipping to a store near you. Quality Analysis Many companies employ people who test the quality of the chocolate they are selling. These people undergo extensive sensory training. Often times they will test quality from one shipment to another to ensure consistency in the product. The testers then write descriptive analysis as to the aroma, flavors, and aftertastes of the chocolate they are testing. At Chocology we are grateful for the community of people around the world who make eating chocolate possible. The commitment and craftsmanship that goes into just one chocolate bar is quite astounding. Makes us want to appreciate it just a little bit more.